Entertainers Shared on Social Media: Anything with “stars” seems to happen at awards show, perhaps because they are “live” (so what does that say about our actors?). Our blooper/failure awards are a tie between John Travolta butchering Idina Menzel’s name while introducing her at the Oscars and Brendan Fraser and his very strange clap. 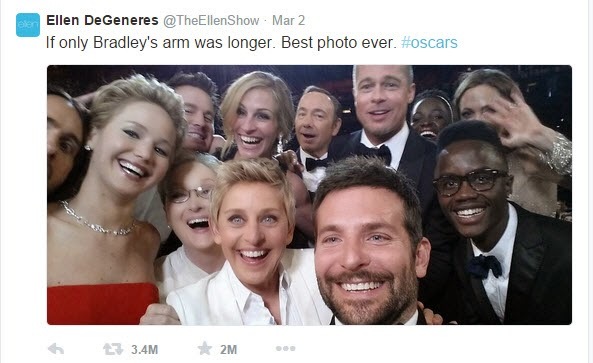 Our top award, though, goes to Ellen Degeneres for use of both social media and technology in her star-studded group selfie at the Oscars, which she then shared on Twitter, where it became the most-retweeted tweet ever. Worst Print Advertising Campaign: This is one that our entire team agrees on…Urban Outfitters outrageous ads get our attention with the shock factor, but we find them tasteless. Best Print Advertising Campaign: We love the Harley Davidson campaign from the Czech Republic, which many of you may not have seen (unless you’re secretly a world traveler). The photography is striking, as is the historical story about WWII riders hiding their bikes from the Nazis. The Old Spice Mom commercial is strange, yet we need to keep watching to see how it ends, so we give it the Most Creepy, Yet Somehow Funny Commercial award. Most Memorable Hack: We started the year with the announcement that the Neiman Marcus network had been breached undetected for three months in 2013 and we finished with the incredible Sony Pictures email hack from Thanksgiving week, the fallout from which appears as though it will continue into 2015. Social media can raise awareness of a cause or need. The Best Social Media Campaign this year stands out in my mind, not for the negligible controversy, but for the positive impact the ice bucket challenge made on the ALS Association, raising more than $100 million in a few months. Finding a Best LinkedIn post is tough since the website feeds you articles geared toward your interests or areas, but a recent corporate post is generating interest as they try to increase viewers with a contest to have Liam Neeson make a video on your profile page. It’s tough to choose one Best Viral Video, as so many seem to pop up each day in our news and social media feeds, so we chose a few favorites. We can find many funny animal videos, but the Best Animal Video is the cat saving his boy from a dog attack. The young man who finds out he is getting a sister and is not too happy about it is Best Kids Video. And the Best Viral Song that spawned more viral videos and parodies goes to Pharrell and Happy. Favorite New Buzzword: There are always new buzzwords, especially when it comes to business and marketing, so we chose a video that pokes a little fun at how we use buzzwords from the eccentric Weird Al. So there is our list. Of course there are more, which I’m sure we will share at our annual holiday office party along with our family traditions and hopes for the New Year. For me, I know one buzzword from 2014 that I could do without – Polar Vortex. From the team at Furia Rubel, here’s hoping your 2015 is happy, healthy and warm.